Editor’s Note: Boardmanship for Charity, Part One, was published in the June 2016 issue; Part Two was published in the August 2016 issue; Part Three was published in the October 2016 issue; Part Four was published in the December 2016 issue; Part Five was published in the January 2017 issue; Part Six was published in the February 2017 issue. Part seven concludes the series. Each personality and communication style has its own basic priority for decision making. A board that is balanced with all four types can be powerful, or it can fight at every meeting. 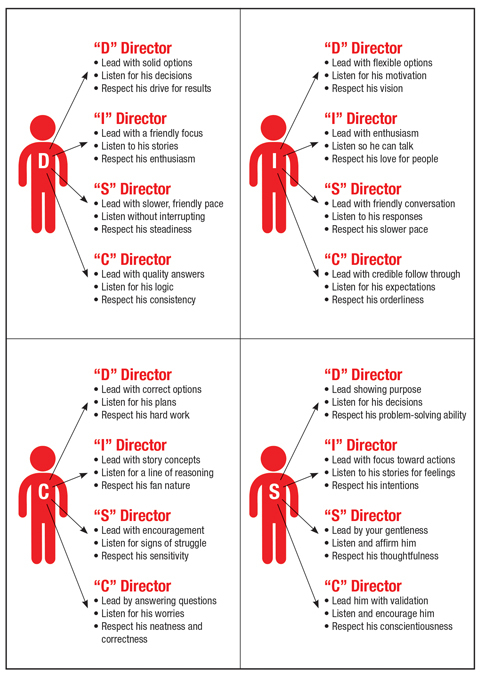 By understanding where each director is “coming from” you can create a united board. For reference, use the DISC diagram at the end of article. The “D,” or Dominant styles, will focus on making the power decision. • They are never hesitant or shy about making decisions (for themselves or for you). • They see situations as problems to be solved so goals can be achieved. • They will use their position and authority in deciding. • They can be offensive to others, who might perceive them as bullies. The “I,” or Influencing styles, will focus on making the popular decision. • They make decisions by talking to people and interacting with them. • They think out loud and need you to listen to them. • They will change their minds several times before they settle on a final decision. • Their goal is to persuade others their way and remain popular with them at the same time. Others may perceive them as chatty and too talkative. The “S,” or Supportive styles, will focus on making the decision that brings about harmony and cooperation. • They make decisions based on stability and predict-ability. • Their focus will be on making everyone involved in the decision happy. • Theirs is a spirit of teamwork and cooperation. • They are the peacemakers and seek to stabilize a routine or a situation in order to maintain the status quo. • Their goal is to remain accepted by the group and still be considered a team player. The “C,” or Critical Thinker styles, will focus on the rules or procedure. • They are data freaks and gather facts, information, and statistics. • They will make a decision based on something in writing: a rule, a procedure, or a law. • They often frown when they are problem solving, but that does not mean they are unhappy. They are very sensitive to double standards and inequities. • They see upholding principles, laws, and rules as their priority. • Others may perceive them as aloof and detached, cold. Those boards that allow discussion by all four types and attempt to incorporate all four priorities in their decisions or votes create a win-win for all involved.